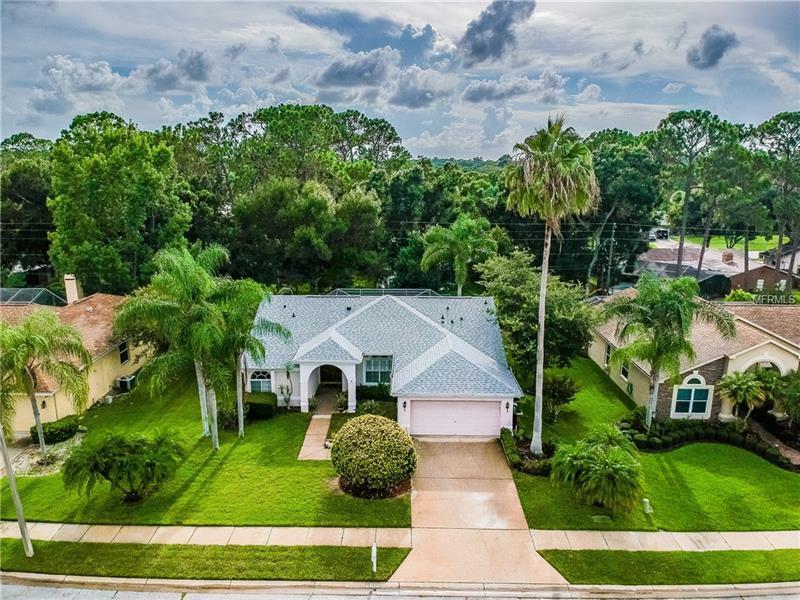 Beautiful Pool Home offers INCREDIBLE VALUE & OPPORTUNITY of nearly 1700 square feet in highly desired BRIDLEWOOD COMMUNITY of East Lake. Double door entry welcomes you home and invites you into foyer and into this popular wide OPEN FLOOR PLAN. Casual combination living and dining area. Prepare your meals and do your entertaining in this bright kitchen which has plenty of cabinets, counter space, BREAKFAST BAR and pantry. Large MASTER SUITE easily accommodates those big furniture pieces. Master en-suite has a separate shower, GRANITE dual counter vanities, HEAT LAMP, separate garden tub and large WALK-IN-CLOSET with CUSTOM CABINET ORGANIZER. Appreciate cooling down in the pool and keep shaded under the COVERED SCREENED lanai. A few big ticket items seller has replacedâ¦ NEW ROOF 2017, NEW A/C 2015 and NEW WATER HEATER 2017. Beautiful PLANTATION SHUTTER in kitchen window, LUSH MATURE LANDSCAPING surrounds the home, garage storage closets and garage workshop are just a few features and benefits of this lovely home. Convenient locationâ¦close to beautiful Gulf Beaches, Restaurants, Shopping, Tampa International Airport, St. Pete, Clearwater, Tampa and Historic Tarpon Springs. NO FLOOD INSURANCE REQUIRED. Make your move!